Seattle based OthersOnline is launching a new attention based social networking service today. 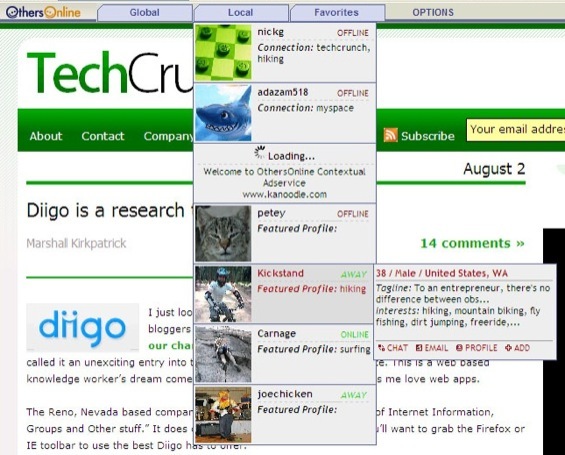 Run through an IE toolbar on Windows machines, OthersOnline will show you users related to yourself via their web surfing habits mixed with user profiles. Contextual advertising from Kanoodle will be mixed in with the list of related users. You’ll be able to see when related people are available online and connect with them by email or IM. Anonymous accounts are available for people interested in that approach. Recommended contacts are split into global and local recommendations, based on the zip code in your profile. Friends can be added to a favorites list for easy IM contact at any time. Will this work? I don’t know, but it’s interesting. Will strangers seek each other out based on common surfing habits? Will this turn into just another space for a large number of men to harrass a large number of women and and a small number of women with webcams to go nuts? If multiple people could communicate at the same time like a perma-IRC, if users could see who was on a page in real time or if other community discourse was possible then this might strike me as more likely to take off. But that’s just my take on it personally; there may be a simple beauty with enough safeguards to make this mass market viable. The company says it’s like “Google for people,” a real time shopping community and a way to take your MySpace relationships out into the rest of the web. Despite the hype of those terms, that sounds like an accurate description of OthersOnline and I think people just might go for it.